Home - On the 11th Day of Christmas…. On the 11th Day of Christmas…. Get out the coloured paper, glue, sellotape and toilet rolls ready to make you own Christmas table decorations in true Blue Peter style. 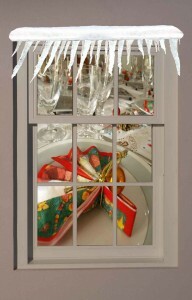 Why not try making elf napkin rings? Very simple to do, and can keep the kids entertained for an hour or so! 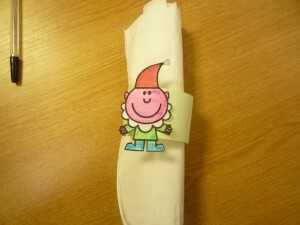 Start by getting some coloured card, a print out of an elf on plain paper so the children can colour it in. Cut out a 2 inch strip of green card, then once the elf is coloured in, make a ring out of the card and stick him to the overlap of the card. Perfect to put round the napkins! Or another great idea, which I enjoyed doing as much as my 6 year old sister, is making a Christmas tree from coloured pipe cleaners and a Quality Street sweet. Simply twirl the pipe cleaner around your finger, straighten one end and put that into the sweet base. Easy peasy! Add a little star at the top to make it really authentic. If the kids are still over excited about Christmas why not click this link for a colour in story, where they can colour and enjoy a good story. Ideal for when you are making some mince pies. Who fancies a laugh? John’s joke time! What’s worse than Rudolph with a runny nose? Frosty the snowman with a hot flush! Anglian Home Improvements raising the standards since 1966. For more great Christmas ideas be sure to keep up to date with the Anglian Christmas calendar.